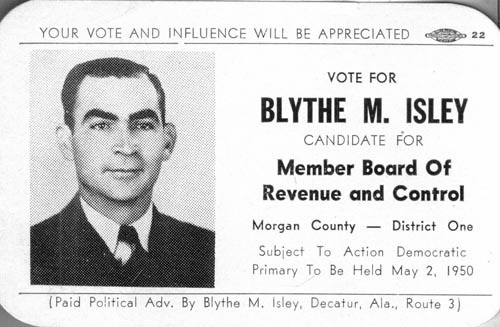 Vote for Blythe M. Isley, Candidate for Member Board of Revenue and Control, Morgan County - District One. Subject to Action, Democratic Primary to be Held May 2, 1950. Are you looking for ISLEY ancestors? If so, we suggest posting a query to our Community Message Board to get assistance from other researchers.